The battle in the short-form video sharing space is heating up after Facebook announced it was bringing video to Instagram, unleashing war on Twitter and its 6-second video app Vine. Several people took to Twitter to say they received an email advertising Vine, hot on the heels after Instagram’s update. 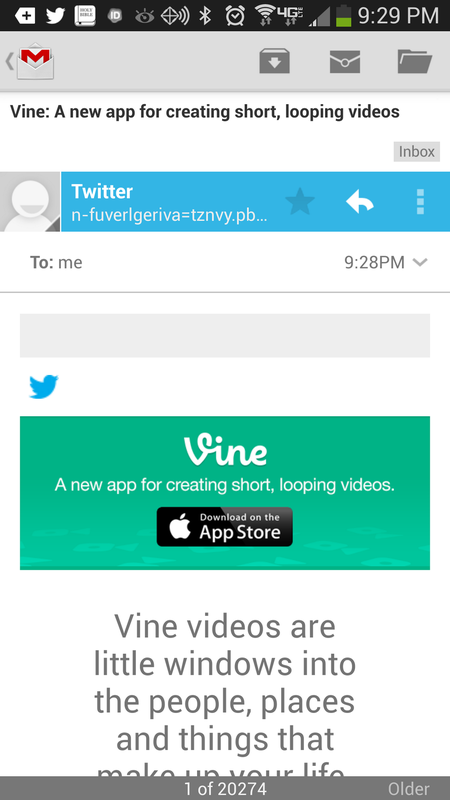 I just got an email from Twitter telling me ALL about Vine. Worried about something, guys? Twitter isn't playing softball with this whole Instagram video thing, just got an email from them advertising Vine. With Instagram’s impressive figures announced just a few hours ago, it is little wonder that Twitter is feeling threatened. There are 16 billion photos shared on Instagram, 1 billion likes every day, and 130 million people use the app every month. Video for Instagram is part of the same app that so many people have found useful – it can record up to 15 seconds, 9 seconds more than Vine, has 13 custom filters, and users have the ability to select their own thumbnail as well. Vine hasn’t been resting on its laurels as well – in a recent blog post it said it would be “introducing some exciting new parts of Vine” over the next few weeks. Earlier this month, Twitter finally launched Vine on Android, as it passed 13 million registered users worldwide. Since its launch back in January, Vine’s iOS version has also gone through several updates that have gone out for the iPhone version since its launch back in January after being acquired by Twitter. This includes support for the iPhone’s front-facing camera, trending hashtagsin the Explore section of the app and Web embeds, among others.